The founding mission of The Bazemore Fund and The Bazemore Society is to honor departing Head of School Tim Bazemore’s 14 years of service as well as to recognize and give tribute to Tim and his wife Lisa’s commitment to the Country School and Horizons partnership. The Bazemore Fund was created in May 2014 to honor our fourth Head of School Tim Bazemore and Lisa, former Associate Executive Director of Horizons Student Enrichment Program at New Canaan Country School, for their 14 years of dedicated service to our community. It also recognizes the Bazemores’ dedication to guiding all students to reach their intellectual, creative, moral and physical potential. The income from this fund provides tuition assistance for Horizons students to attend New Canaan Country School. The Bazemore Society, named for Tim and Lisa Bazemore, was founded in 2014 to recognize and honor those members of the Country School community who donate to the Bazemore Fund, over any period of time, a cumulative total of $2,500 or more. As of June 2018, approximately $285,000 has been pledged in support of the Bazemore Fund. Click here for a list of members. Society members are invited to gather annually to meet and be inspired by those most impacted by Country School and Horizons tuition assistance programs: Horizons students, alumni, parents and teachers. On May 22, 2018, 40 members of the Bazemore Society gathered on campus for breakfast and to hear from Country School students who are also Horizons Scholars. Two members of the Class of 2018 who are Horizons Scholars are Jennifer Llamas and Brian Villalta, and together with NCCS alumnus and former Horizons Scholar himself, Joseph Chan, shared moving stories about their personal academic journeys. Tim Bazemore joined in by sending a pre-recorded video to the group with messages of congratulations to the students and appreciation to Joe Chan for his continued devotion to NCCS and to Horizons. The next Bazemore Society event is scheduled for Spring 2019. Over forty guests attended the Bazemore Society Breakfast on Jan. 20, 2015. They heard from Jackie Roberson, Horizons Dean of Students and Academic Coach and Social Worker in the Norwalk Public Schools, Dora De Andrade, a mother of three Horizons program participants, John Hastings, Horizons Summer Program teacher and NCCS fourth grade teacher. The breakfast concluded with remarks from Tim Bazemore, who had traveled from Portland, Ore. to attend the event. 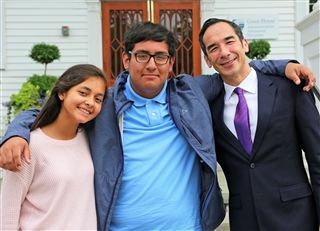 The inaugural Bazemore Society breakfast was held on June 9, 2014, and featured remarks by three recent Country School/Horizons graduates: Jasmine Rodriquez ’11, Andres Soto ’10 and Susan Zhou ’10. For 52 years, New Canaan Country School has given thousands of public school students the opportunity to experience an independent school education through Horizons. Horizons at New Canaan Country School now serves over 400 students in grades K through 12 from lower Fairfield County. The success and impact of this public/private partnership has led to the Horizons program’s replication, to date, in 17 states nationwide and, ultimately, to the formation of Horizons National in 1995. If you would like to make a donation or pledge to the Bazemore Fund, you may do so online at www.countryschool.net/giving, or by contacting Director of Advancement Terry Gumz at (203) 801-5633 or tgumz@countryschool.net.